Home › Our Story › Why Our Moniker? The exquisite rare Iberian lynx (Lynx pardinus) is the most endangered wild cat species on earth. This critically endangered species once roamed freely among the olive groves and the cork oak forests of Portugal and Spain. 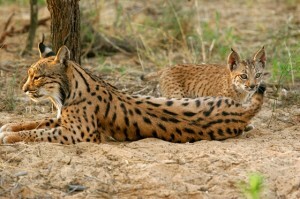 If the lynx goes extinct it will be the first feline since the saber tooth tiger to suffer that fate! The latest report is that there are now 309 living in the wild up from 94 reported in 2002. 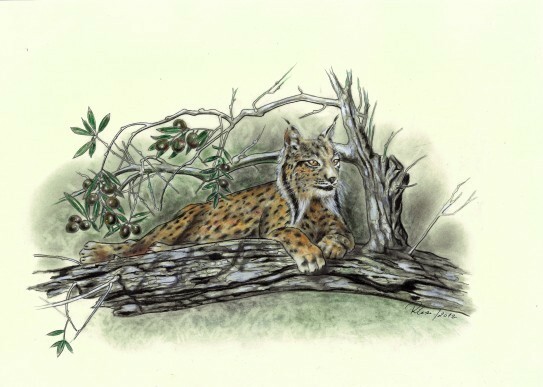 Breeding and conservation efforts are being implemented in Portugal and Spain to revive the Iberian Lynx. Why invest in saving a dying species? For us it is about remembering our own wild nature, and the delicate balance of life. The word lynx comes from the Greek “to shine” due perhaps to their beautiful shining golden eyes. As our unique products are rare, we have chosen this beautiful creature as our emblem. National Iberian Lynx Reproductive Center (CNRLI) in Silves, Portugal. Rare Lynx also pays tribute to the 17th century Academy of Linceans (Lynx-eyed), considered the first founders of modern natural history, Galileo being their most famous member. 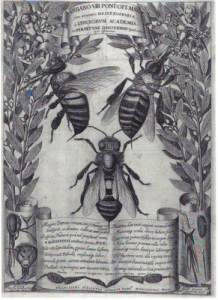 The Linceans, inspired by the keen eye, stealth, and mysterious nature of the lynx, were devoted to recording their intensive observations of the inner and outer nature of plants, animals and minerals, of the New and Old World, utilizing Galileo’s new instrument, the microscope, through gloriously detailed meticulous drawings.